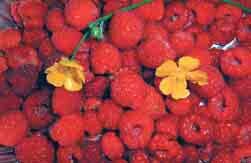 The red raspberry as we know it today has probably been cultivated for more than 2,000 years. It is indigenous to North America and Asia Minor, with the first recorded use by the ancient people of Troy. Records of the berry’s domestication have been found in the journals of Palladius, a 4th century Roman agriculturist. The Romans appear to have eventually spread raspberry cultivation throughout Europe. 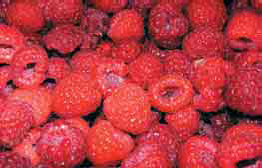 Later, the Britons cultivated and improved raspberry varieties and are known to have brought them to New York by 1771. Most of the varieties in commercial production today are hybrids of imported and native varieties selected for hardiness, flavor and handling characteristics. Ninety-five percent of the crop is processed or frozen, with Washington, California and Oregon the three highest producing states by far. However, in today’s world of commuter fruit and vegetables, and the ability of every supermarket to satisfy our taste buds with a wide variety of well-traveled foods, the raspberry stands out as a relatively untraveled fruit. The chances are very good that if you like raspberries, you either grow them or know someone who does. By the time a raspberry (picked ahead of its time) reaches the specialty fruit shelf in your local market, it has been over-handled, over-packaged and mightily overvalued. How much would you pay for under-ripe berries, which, unlike the convenient tomato, not only cease ripening, but also begin to rot at just about the moment they are arrive on grocery shelves? In short, the best raspberries are picked by the people who are going to be eating them. So how difficult is it to grow your own raspberries? All you really need is an area at least 10 square feet that receives six or more hours of direct sun and has good drainage. Raspberry roots should be easy to come by if you know anyone who grows them. Raspberries are escape artists. The plants tend to spread by underground runners, or stolons, and before you know it there is a raspberry coming up in the daisy patch. These fugitives can be dug up in the spring and replanted somewhere they are wanted. If you can allow three feet between rows and three feet between plants, you’ll have picking room when the time comes. You can also mail order raspberry roots, or look for them at a local garden center. Chances are, they’ll carry a variety that does well in your area. Your agricultural extension agent will be familiar with the appropriate varieties, also. The soil your raspberries are planted in doesn’t have to be all that good, as long as it drains well and you mulch the rows with compost or rotted manure that is fairly finely ground. The soil pH should probably be around 6.0-6.5. Low pH soils can be adjusted with six oz. per gallon of Natural Liquid Lime per 100 sq. ft about once every six weeks during the growing season. At planting, fertilize the soil with three oz. per gallon of 4-3-3 Natural Organic Fertilizer, five oz. per gallon Natural Liquid Bonemeal and one to two oz. per gallon of Natural Kelp and Sulfate of Potash mixed together. Use about a gallon of solution per 100 square feet. Reapply this solution without the bonemeal once per month until harvest. After the berries are finished for the season, fertilize once more with the bonemeal and kelp only. For foliar applications, mix two to three oz. of 4-3-3 Natural Organic Fertilizer per gallon of water and apply as a fine mist to 100 sq. ft., covering the leaves with solution in spring after the leaves open and again after first bloom. Then mix one to two oz. of Natural Kelp and Sulfate of Potash per gallon of water and apply once or twice during fruit formation up to three weeks before final harvest. The addition of a biodegradable surfactant, or spreader, increases effectiveness by increasing adhesion to the leaf surface.